Announced in a joint press release, the acquisition represents a successful exit to eero's startup activities, which began in 2014. Details of the deal have not been disclosed pending closing conditions. It appears that Amazon will use eero to further an ongoing push into the smart home space that began with the e-tailer's line of Echo speakers. Loaded with Alexa voice assistant smarts, the smart speakers serve up answers to general customer queries and present another access portal to Amazon's online store. "We are incredibly impressed with the eero team and how quickly they invented a WiFi solution that makes connected devices just work," said Dave Limp, SVP of Amazon Devices and Services. "We have a shared vision that the smart home experience can get even easier, and we're committed to continue innovating on behalf of customers." Mesh networking solutions solve the problem of Wi-Fi dead spots by employing cooperative hardware nodes to evenly distribute consistent coverage over large areas like multi-level homes. The system presented by eero goes a step further than conventional mesh products with a streamlined setup and hardware management process, advanced user and parental controls, cloud connectivity for updates and other value-added features. In 2017, the startup updated its lineup with a tri-band Wi-Fi base station and dual-band Beacon devices that plug directly into wall outlets for easy installation. Perhaps of interest to Amazon, the second-generation hardware features Thread radio components for communicating with low-power "internet of things" devices. 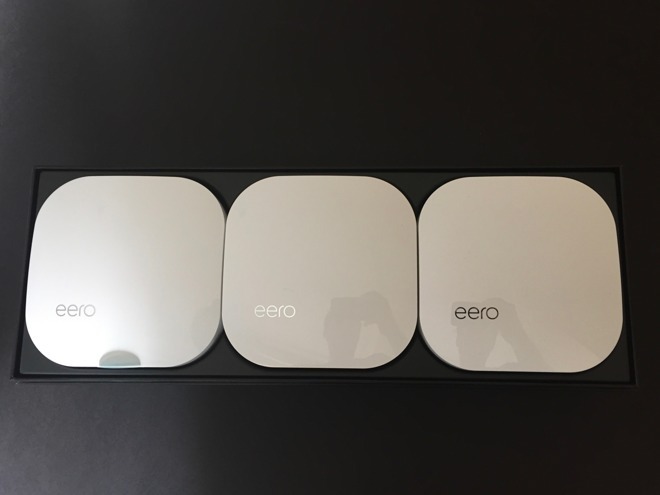 AppleInsider reviewed the first-generation eero system and found it to provide adequate coverage of a multi-story house. Beyond Limp's statement on "innovating on behalf of consumers," Amazon's plans for eero are unknown. Amazon's Echo range would make a suitable platform for integration, potentially offering users both Alexa and enhanced Wi-Fi with a single device. In return, Amazon will likely retain unfettered access to eero users' internet usage habits. The second-generation eero system is still up for sale on Amazon's website, with full sets -- one base station and two Beacons -- starting at $399. For Sale: Lightly used Eero system. Will consider interesting trades. And if I can't sell the units, I will never, ever update the firmware, period. Sad indeed. Eero seemed like a viable network for difficult living spaces. Now it's just another spy in your personal space - feeding your information to others for profit without your consent. East Germany had the Stasi and all their collaborators to oppress their population by surveillance- today we have Amazon, Google, Facebook, Twitter . . . Anyone know any good third party firmware for Eero? I expect to see a lot of them on the market soon. Thank God , I didnt upgrade my AirPort Express. There's plenty of stuff they could do, but if it's not a major line of business they won't. Obviously they felt their wifi business wasn't worth it any longer. I doubt they will return. No. I believe they exited for good. Good choice. I am happy that I didn’t upgrade from my Apple Airport. There is difference between designing a product in China vs manufacturing it in china.